A few weeks ago I promised to bring in some more general news from the world of Linux audio software development. Alas, my plans were ambushed by the happy intrusion of the release of Renoise for Linux, but I'm back on track. As promised, here's more straight reporting on the world of Linux sound and music software, starting with some news about recently released music notation programs. I've covered notation editors in depth in a previous series about music notation software for Linux. However, some interesting developments have occurred since I wrote that article. NtED marks the return of Dr. Joerg Anders into the field of Linux music notation software. Professor Anders is perhaps best known for his pioneering NoteEdit. Many of that program's best features are present in NtED, and the list of planned improvement indicates that the good doctor intends to take special care of his project. 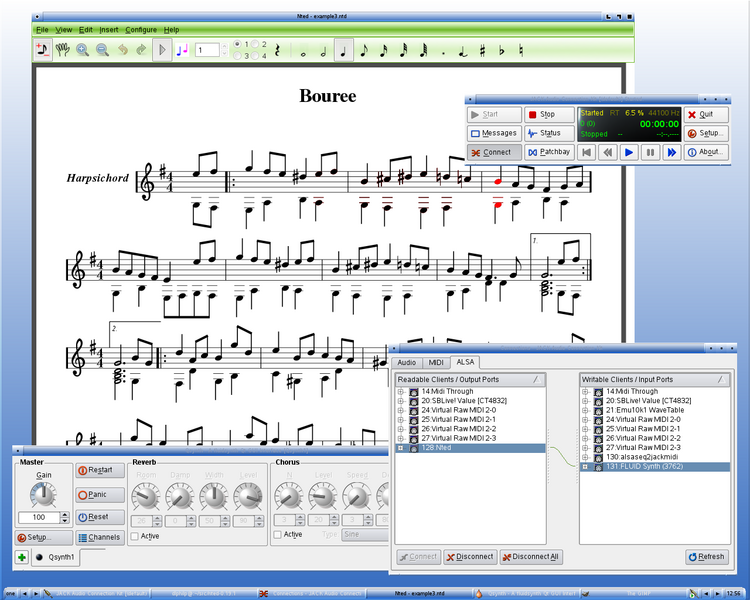 NtED is advertised as a true WYSIWYG notation editor, with MusicXML import capability and MIDI and PostScript export functions (for printing scores directly from NtED). Four-part polyphonic staff entry is supported, along with score playback (via TiMidity or any synthesizer connected to an ALSA sequencer port) and a wide variety of rhythmic values and other staff directives. As I wrote this report I discovered that Dr. Anders has released version 0.19.1 of his program (Figure 1). I was a fan of his earlier work, and I must say that I continue to be impressed with this newer project. Of course, at this stage NtED is still evolving, but it is already stable and useful music software. On my personal wishlist, I'd like to see support for LilyPond and MusicXML as export targets, I think those features would greatly expand NtED's appeal and utility. Meanwhile, there's more than enough in NtED to keep me happy and productive. Although its most recent release is version 0.9.1, MuseScore is a relatively new addition to the Linux music notation software armory, but chief developer Werner Schweer is certainly no stranger to the domain of Linux audio development. Werner's Muse is one the top-ranked audio/MIDI sequencers for Linux, and that program is in fact the genesis point for MuseScore. 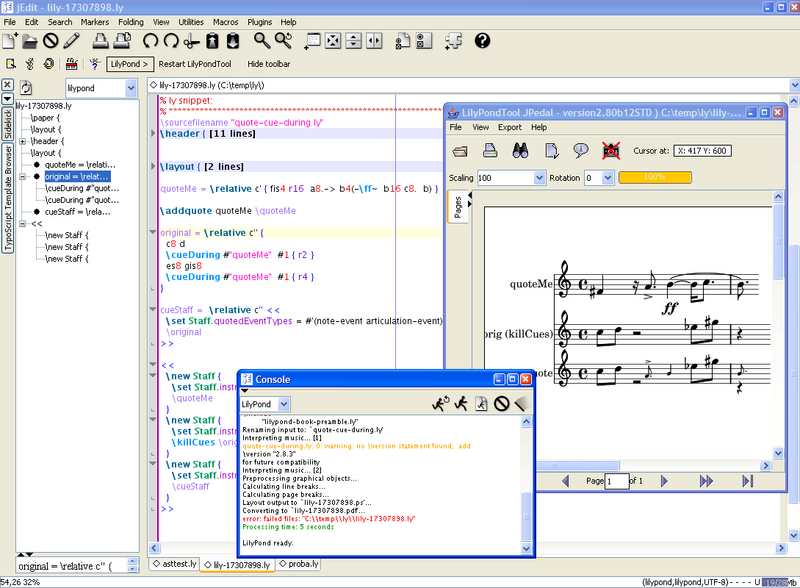 Muse's original design included a notation editor, but its developer wisely considered that further development of that editor would continue best as stand-alone program. 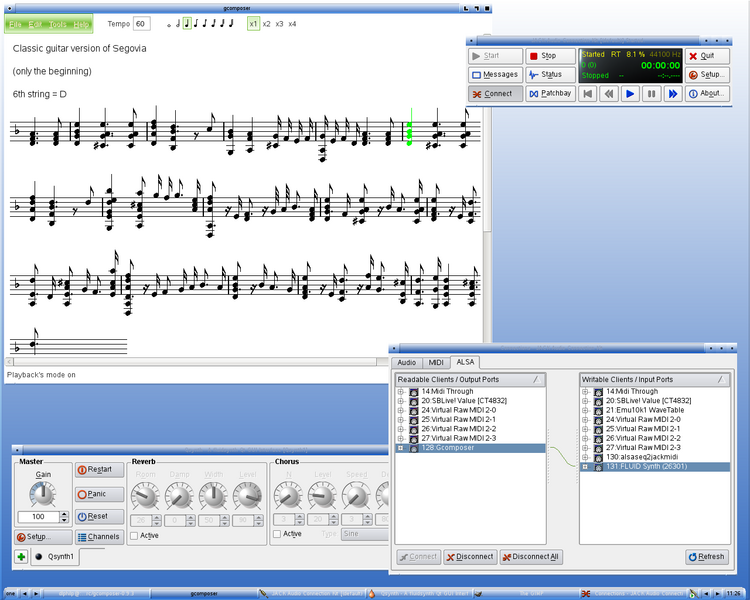 Like NtED, MuseScore is a true WYSIWYG editor, complete with support for score playback and import/export of MusicXML and standard MIDI files. Percussion notation is supported, as is direct printing from the program. MuseScore's features are too numerous to list, here so I'll simply point readers to the program's Web home for more details. Alas, MuseScore's dependencies include a version of Qt (4.3 or higher) that is not available in the stable repos for my JAD and 64 Studio systems, so I was unable to build and test it under Linux. However, I discovered a rather unusual way to test the program: I ran its Windows version under Wine (Figure 2). Since the software is intended to run identically across the platforms, I figured I'd at least be able to see what it looks like. I was pleased to discover that I could use MuseScore with the wineasio driver, thus allowing a hybrid setup to test the program's scoring and playback capabilities (FluidSynth is built into the app). However, I did not test printing from the Windows version (no printer hooked to my JAD box, sorry). By the way, readers who have been following Alex Stone's fascinating odyssey into Linux audio may be interested to know that Alex has also been experimenting with MuseScore and that it appears to have become the notation centerpiece of his Parchment Studios. This employment speaks well for the program, given that Alex's work is mainly orchestral music. Cedric Roux, a.k.a. sed, describes his gcomposer as "a little tool to write music". While it does not aspire to the magnitude of NtED or MuseScore, it is a good program within its (self-imposed) design limitations. First, it's perhaps best for guitarists. Sed is himself a classical guitarist who wanted a compact notation editor with a small but flexible features set. In the true spirit of the Linux audio software hacker, sed had an itch, he scratched it, and thus was born gcomposer (Figure 3). gcomposer is available as a source code package for Linux and as a precompiled binary for Windows. The program has few dependencies, is easy to build, and is even easier to use. Sed may expand it to support MIDI and LilyPond as export targets, which will be nice, but gcomposer is indeed already a neat little tool for writing music. Meanwhile, LilyPond itself continues to mature. LilyPond stable is now at version 2.10.33 (my OpenSUSE 10.2 repos are still on 2.8.7), with the development sources at version 2.11.39. I'll not rehearse a litany of praise for LilyPond, I'll just point readers to the Web site. While you're visiting, take the time to read the excellent essay on automated music engraving. If you've ever wanted to know the rationale behind LilyPond, you'll want to read this essay. Alas, LilyPond documentation developer Graham Percival has announced his departure from the LilyPond team. Fortunately his leave-taking is amicable, and Graham has solicited the community for volunteers to take up the slack for the not-inconsiderable task of developing and maintaining the LilyPond documentation project. Interested readers should consult the relevant traffic in the LilyPond mail-list archives and contact the development team (see the LilyPond Web site for contact adresses). Graham put an enormous amount of work into organizing and expanding a very complex project, and he has high hopes for its continued development. Good luck in future projects, Graham, and thanks for your great contribution to LilyPond. And since we must have screenshots, Figure 4 shows off jEdit running the very cool LilyPondTool plugin. 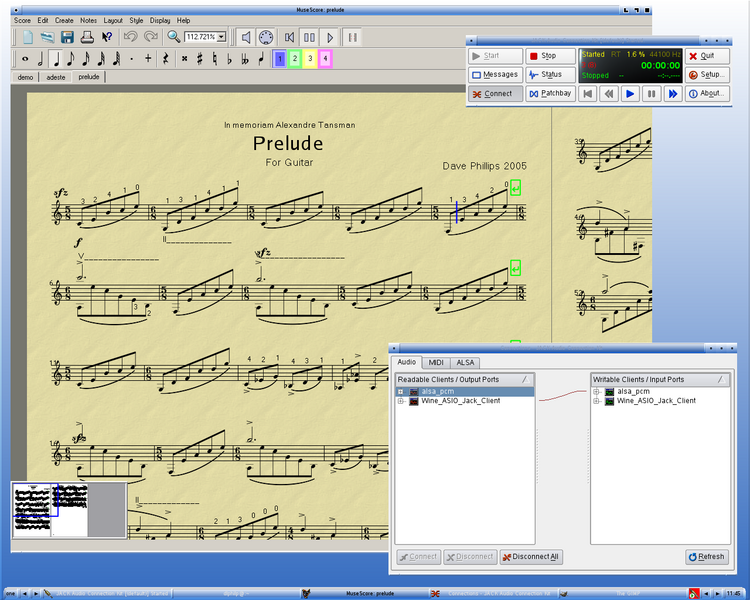 See the Music Notation pages at linux-sound.org for a list of other graphic editors for LilyPond. I'll have more reports coming up next week. Ardour 2.3 has been released, I still owe you all some news about the LinuxSampler project, and did I mention that I'm now the proud owner of an XO laptop ? More about all that when we meet again. Until then, stay tuneful.